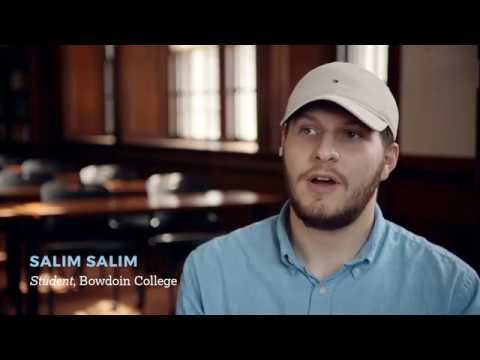 Salim Salim, a 2016 Deering High School graduate who is now a student at Bowdoin College, wants to make a career of helping immigrants like himself. “I want to play a role in making the education system better for people from my community that are underserved, underrepresented and undervalued,” said Salim, who is from Iraq. He plans on a double major in government and legal studies, concentrating on international relations; and in education, with a concentration on policy. One career he is considering is becoming an immigration attorney. He’d like to work for global organizations that promote peacekeeping and provide legal assistance. Salim credits the Portland Public Schools – especially Deering – with being a welcoming and inclusive community where he was able to learn to be a leader. “The Portland Public Schools have taught me to find the value in my difference so now I can use that difference to make a change in my community,” Salim said. Salim’s elementary school education was a mosaic of different schools, countries and languages. He started school in the Iraqi city of Mosul. Then, for safety reasons, his family moved to Kurdistan, where he attended an Arabic school that also taught Kurdish. The family moved around again and ended up in Turkey as refugees for the United Nations. There, Salim had to learn Turkish and catch up on missed schooling. In 2010, his family immigrated to Portland, where they had a sponsor. Salim started sixth grade at Lincoln Middle School. At first, he was so busy learning English and adjusting to life in America that he stayed in his “comfort zone” – socializing mostly with family and other Iraqis. Also, Salim said, Deering “sparked my interest in learning outside the classroom.” For example, he joined organizations such as Seeds of Peace, which helps students learn leadership skills and become leaders that instill change in their communities in hopes of making a more peaceful world. He was student body president during his senior year and, with other Seeds of Peace members, facilitated dialogues at Deering and other schools. At one point, they traveled to Presque Isle to lead a discussion with high school students about new Mainers like himself. Salim in high school was at first placed in a low-level English class as a freshman. He wanted more challenge, and was able to switch to a college-prep class, where he earned top grades. This year, as part of its new Comprehensive Plan, the district has an Equity goal. Among steps to achieve equity is opening advanced-level classes to more students.